I am making good progress on my quilt. This is a tough one because the cutting is so very tedious. My brain in numb from it and I'm spacing things like where I put my keys and Xander's piano lessons and whether or not I've changed Aubrey's diaper yet today and if I still need to brush my teeth this morning. I'm finally finished with the larger squares. This makes me gleeful. There were 134. I'm debating on what to do for the smaller squares. I need some input from you all! Pretty please? 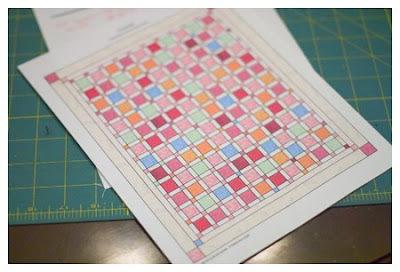 Remember, this is a "sketch" of my quilt: My original thought was to do the smaller 2" squares from clothing fabric as well. I don't want to do this because it's tedious, but I'm thinking it will look the best. I have plenty of fabric. So, what do you all think? Substitute some other fabric (probably flannels in orange, pink and green) or keep on with the little squares? 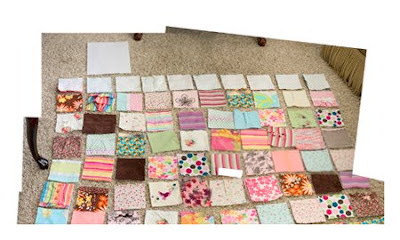 Here's the quilt laid out on the floor to get the placement. I do with with the random ones to get even distribution. It's a technical process, involving lots of time down on the floor analyzing things that no one is going to care about in the end. I lost my wide-angle lens (I know, how could I lose it? Yet, I have). There was no way I was getting the whole thing in and my photos do not want to merge, so this was the best I could do. This is the top half: I love the way it's looking. I was worried it was going to look too random and not cohesive, but they actually go together beautifully. I love all the ruffles and buttons and embroidery! And the memories--I've haven't cried yet and I'm enjoying remembering her in all these outfits. You can see I turned over the squares and used a water-soluble marking pen to write numbers and letters on the back. This was a stroke of genius, if I do say so myself. No second guessing which way the squares go, no worrying if the squares get mixed up by some child. I'm doing it this from now on. It was especially easy since the squares are all backed with flannel. Hey readers! I added a poll to the side, so vote away. I could really use some feedback. I can't wait to see the finished product. I love the way it's flowing!